With the installation of the Nedap’s SENSIT system, drivers now know exactly how many parking spaces there are available when they arrive at the Port of Antwerp’s Havenhuis parking facility. 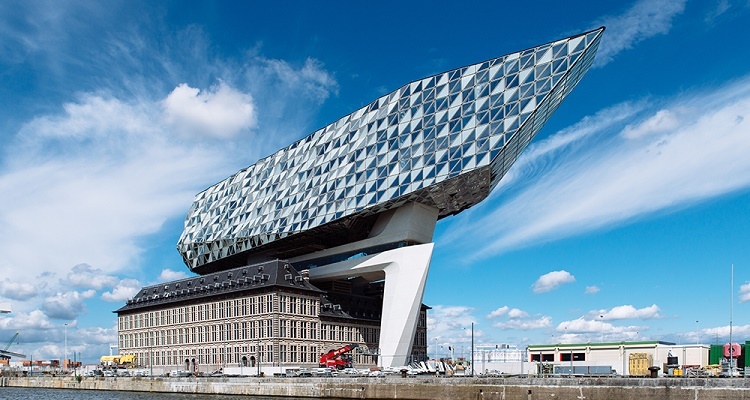 This impressive building, that has the shape of a ship, is both the workplace for 500 employees as the central meeting point for international contacts. Offering a convenient service to its employees and visitors, it was an important requirement for the modern parking facility was that all drivers be informed about the number of available parking spaces in real-time. In addition, drivers have to be guided to the spaces that are available on the moment of arrival. Nedap’s smart parking system was chosen as it meets both criteria. A SENSIT Surface Mount sensor installed at every individual parking space detects in real-time whether or not it is occupied and for how long they have been occupied. This smart service creates a fast flow of vehicles and ensures both employees and visitors enjoy the comfort of easily finding an available parking space. “The combined Nedap systems offer a complete solution that meet all requirements of the Havenhuis. The possibilities of these systems have a lot of potential for the port in the future,” said Marc De Caluwé, network engineer at the Port of Antwerp.